On Thursday night, Georgios Bartzokas will lead a foreign team into Greece to face Olympiacos Piraeus for the second time in his career! Bartzokas, who led the Reds to the 2013 Turkish Airlines EuroLeague crown, first visited Peace & Friendship Stadium with FC Barcelona Lassa last season and is now the head of bench at Khimki Moscow Region. Bartzokas was one of the greatest talents of his generation in basketball and one of the most athletic big men of the time in Greece, with a flair for scoring and rebounding. The only team he played for was Maroussi before he was forced to retire at age 27 after two serious knee injuries. But an obstacle turned into an opportunity as his premature end to his playing days opened the door to a coaching career at a very young age. His first job as a head coach was with Olympia Larissa. Then came stints with Maroussi, Panionios and the big move to Olympiacos in the summer of 2012, when he succeeded Dusan Ivkovic and took over the European champions. What came next is well known. Now, he’s one of the most renowned coaches in the EuroLeague. A former Euroleague Basketball Alexander Gomelskiy Coach of the Year award winner, he has a title (2013) and Final Four appearances with two teams (2013 and Lokomotiv Kuban Krasnodar in 2016). Coaching a club like Olympiacos is a significant event in any coach’s career, but all the more so for Bartzokas. With the Reds he became the first Greek coach to win the EuroLeague (he has been since followed by Dimitris Itoudis with CSKA Moscow) and his name deservedly took off. He never hide the fact that he was a fan of the Piraeus team and this, combined with his fiery temperament, contributed to a very emotional run with Olympiacos. All good things come to an end and his “divorce” with the team was unexpected and difficult, coming a few days before the opening tip of the 2014-15 EuroLeague season after losing to archrival Panathinaikos Athens in a Greek Cup game. He decided to leave and handed in his resignation following excessive reactions by fans who couldn’t accept consecutive defeats at the hands of their bitter rival. “You have to become the change you want to come,” he said then of his decision and since has avoided talking about anything related to Olympiacos in general and about the reasons that led him to leave in particular. The plan changed: a traveler and creator! Experiences shape who we are and where we want to go. Coach Bartzokas is no exception to this rule. Surely, he had in mind that Olympiacos could develop into a beautiful situation that would last a long time. A top club, good conditions for winning titles and an opportunity to make history with the team he loved since he was a boy. The truth is that this seemed like a likely scenario, especially after winning the title in London in 2013 with impressive basketball and double-digit leads in the semifinal and the final. 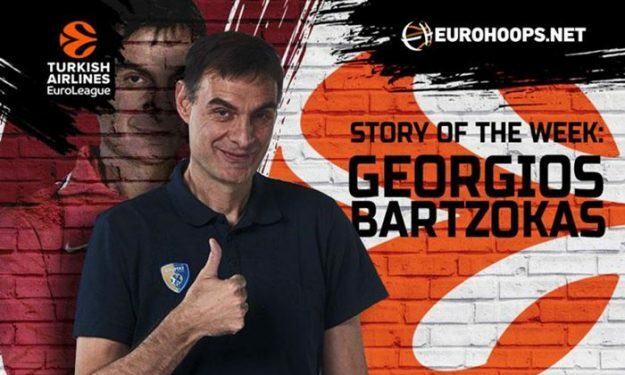 But, there was a different plan in store for Bartzokas and he certainly changed his thinking and his plans when his collaboration with Olympiacos suddenly came to an end after the first official game of that season. Now everything points to the fact that his first goal was to work abroad, away from his home country. He joined Lokomotiv in 2015 and had a wonderful season in which he led the team to the Final Four for the first time in the club’s history. Then came a season with Barcelona in which seemingly everything went wrong and he and the team had a poor season. But that chapter has closed and a new one has opened in Khimki. It appears that Bartzokas, with the passing of years, is becoming a traveler. He is on a journey where he will get to know new cultures, take on new challenges and do what he likes and is talented at: creating new and powerful teams! Bartzokas has proven that he has ways to create competitive teams, even with very small or limited budgets. In his first season in Maroussi, he was a win away from qualifying for the EuroLeague playoffs with one of the lowest budgets in the league. As it turns out, though, his most important asset is finding and trusting players, and helping their careers take off. Players like Jamon Gordon, Matt Lojeski, Othello Hunter and Jon Diebler, among others, saw their careers upgraded because Coach Bartzokas believed in them at a time when they were unknown at the top level. Players like Bryant Dunston and Chris Singleton made their first appearance in the EuroLeague under Bartzokas and this season, the rookie Anthony Gill and Malcolm Thomas (though he had played briefly for Maccabi Tel Aviv five years ago) are similar cases. Knowing how to pick players is a talent, as is the ability to create strong squads capable of making their mark in the EuroLeague. Bartzokas has done this at every team he has worked at, except for Barcelona. What will happen with Khimki? The prospects look excellent and the team seems like it has the arsenal it needs to go very far. This, though, takes time to be judged and it requires that Coach Bartzokas’s new project gets tested first. The first serious test is the one coming up against Olympiacos in Piraeus. The place where, whenever Bartzokas returns, no matter how many years have gone by, he himself is tested… to master his emotions.